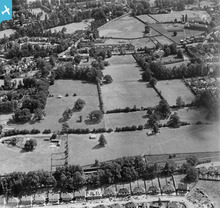 [EPW051617] Leybourne Grange Colony during construction, 1936. This image has been produced from a print. 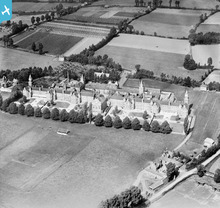 Opened in 1936, Leybourne Grange Colony housed patients termed 'mentally defective' i.e. persons with severe learning difficulties. 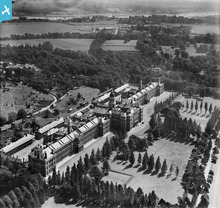 The hospital housed up to 1,200 patients, both children and adults. 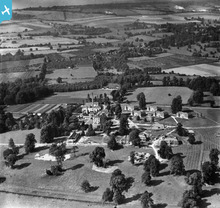 The buildings were centred around Leybourne Grange, a Victorian mansion originally built for Sir John Hawley. Other buildings included dormitories, a main hall that doubled as a church on Sundays, a nurses’ home and a hospital wing. 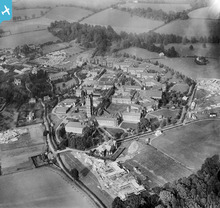 The hospital closed in 1996 and the site is now occupied by the Leybourne Chase housing development with the Manor House, clock tower and a few outbuildings being retained. Former West Ham Borough Asylum founded 1898, opened 1st August 1901. 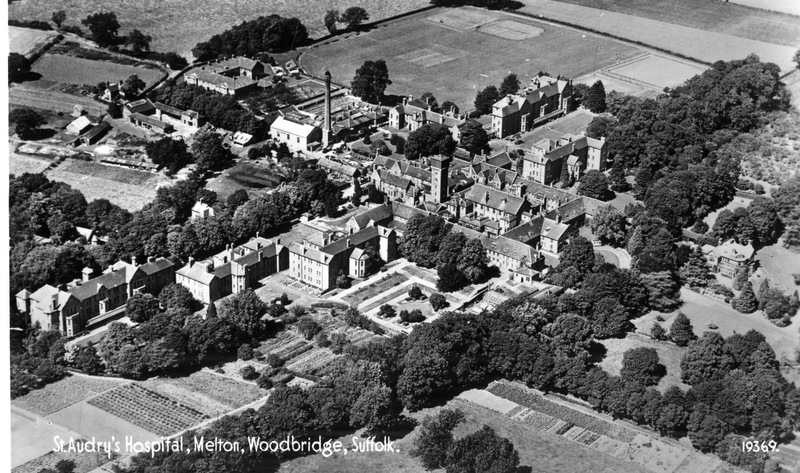 In 1918 the Asylum was renamed the West Ham Mental Hospital. 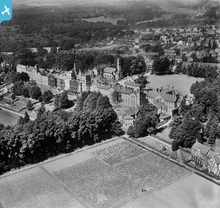 The hospital was extended in 1925 and 1928-1934. During the 1930s newer treatments were introduced at the Hospital, including insulin coma in 1937. 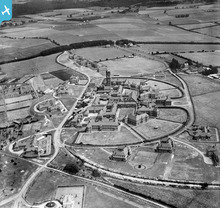 During WW2 the Hospital joined the Emergency Medical Scheme and four of its wards were converted into an Emergency Base Hospital. 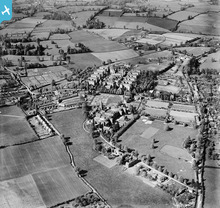 In 1948 the Hospital joined the NHS and during the 1950s began to operate an 'open-ward' policy. An Industrial Therapy Unit was also established, aimed at the rehabilitation of chronic patients who had become institutionalised. 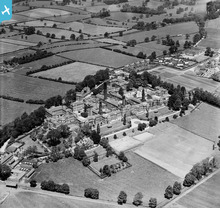 In 1956 the Hospital had 1,356 beds, reduced to 1,331 in the following year. In 1975 there were 1,087 beds, in 1989, 674 beds and in 1993, 452 beds. 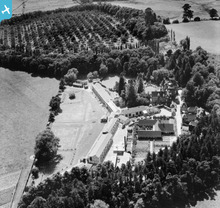 The Hospital site is still currently in use, with the laundry, water tower and boiler house providing services also for King George Hospital which relocated to the site in 1993. The original buildings have now mostly been replaced and are likely to be redeveloped as housing. 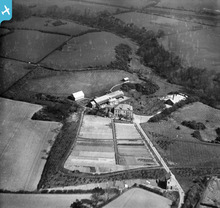 [EPW001280] The asylum and workhouse, Fishponds, 1920. This image has been produced from a copy-negative. The Bristol Lunatic Asylum was opened in 1861 in buildings by Henry Crisp. Originally designed for 250 in-patients, in 1900 (following several extensions by both Crisp and George Oatley) it housed 951 long-term patients (419 male, 532 female). In 1914, the hospital was requisitioned by the War Office to become the Beaufort War Hospital treating wounded soldiers. 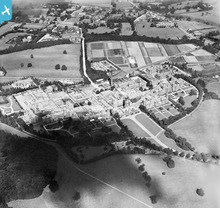 Apart from 45 patients who were retained to work on the estate, existing mental patients were evacuated to other asylums in the south-west, some as far afield as Cornwall and Dorset. Most of the permanent staff were retained, and were joined by 25 physicians and surgeons and a large intake of nurses. 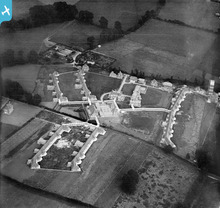 The hospital was returned to civilian use in 1919. 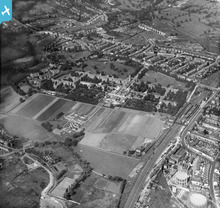 In 1948, the hospital joined the NHS and was renamed Glenside Hospital. 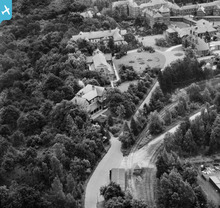 From January 1993, the co-located Manor Park and Glenside hospitals merged to become Blackberry Hill Hospital. A programme of phased partial closure saw most patients assessed for capability, with many placed within the Care in the Community programme, and others moved into new buildings constructed on the former Manor Park site for long-term care. The former Glenside Hospital campus was bought in 1996 to become the main campus of the University of the West of England's Faculty of Health and Community Studies. Opened in 1909 by the Metropolitan Asylums Board as the Children's Infirmary, Carshalton Beeches. 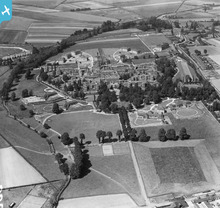 Queen Mary became the hospital's patron in 1914 and it was renamed Queen Mary's Hospital For Children in 1915. The Carshalton Hospital contracted in size with advances in medical science and moved to the St Helier Hospital site in 1993. Nearly all of the buildings have since been demolished. 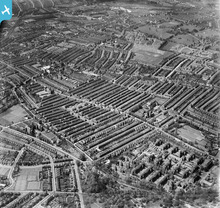 [WPW016938] View of Cardiff showing Whitchurch Hospital, oblique aerial view. 5"x4" black and white glass plate negative. Broadmoor Secure Hospital. Italianate corridor plan buildings by Joshua Jebb, opened 1863 as Broadmoor Criminal Lunatic Asylum. Housed, and continues to house offenders with serious mental health conditions. 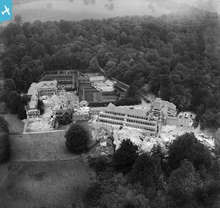 Stoke Park Colony - Mental handicap hospital built around the Dower House, an Elizabethan mansion with c18th and c19th additions. Established 1908 as part of the 'National Institutions for Persons Requiring Care and Control' by H.N. and K. Burden. Closed 1985-8 and developed for housing with the Dower House was converted to apartments in 1997. East Sussex County Asylum - Hellingly Hospital. Compact Arrow plan buildings by G.T. Hine, 1898-1903. Detail: Chapel, Administration and hospital electric railway. Govilon hospital was built by the US Army as 279th Station Hospital. It had 52 wards and 4 operating theatres. The hospital catered for those with serious injuries that the frontline field hospitals could not deal with, such as skin grafts and amputations. St Francis' Hospital, formerly Brighton Borough Asylum. St Helier Hospital was founded in 1938 when Queen Mary laid the foundation stone. The building was completed in 1942 but less than a month later was damaged by a bomb and was struck by two flying bombs in June 1944. The hospital remained open, treating many casualties of war from nearby London. The hospital is still open as a general hospital. 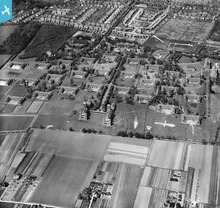 [WPW016910] Unidentified oblique aerial view. 5"x4" black and white glass plate negative. Parc-Gwyllt, Glamorgan County Mental Hospital, opened 1887. 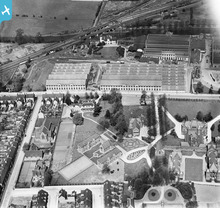 Closed 1988, demolished and replaced by HM Prison Parc. 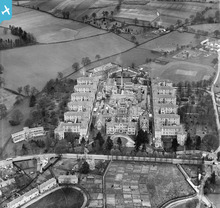 [EPW024469] Menston Mental Hospital, Guiseley, 1928. 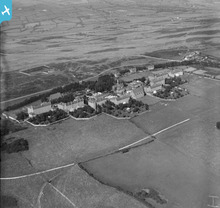 High Royds Hospital opened 1888 as the 'West Riding Pauper Lunatic Asylum'. Buildings by J. Vickers Edwards. Closed in 2003 with some buildings retained as part of a new 'village' development. Imbeciles Asylum at Leavesden. Yellow brick pavilion-plan buildings, 1868-70 by Messrs. J Giles & Biven for the Metropolitan Asylums Board. Housed persons with senile dementia and learning difficulties. 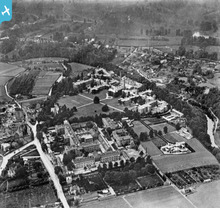 Netley Hospital was an army hospital. Demolished in 1966. Queen Anne style buildings by Robert Stark Wilkinson, 1886. 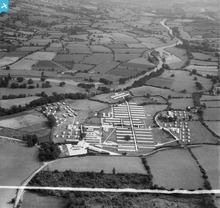 Became Digby Hospital in 1949 after joining the NHS. 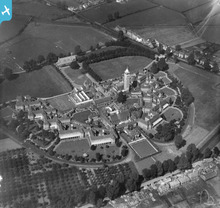 Later merged with Exminster and Wonford house as Exe Vale hospital. Closed in 1987 and now converted to housing. Built to a design by Henry Duesbury 1848-1851. 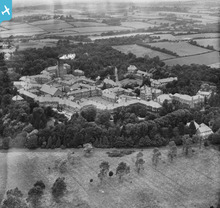 The Derbyshire County Asylum was later known as Pastures Hospital. The hospital was closed in 1994 and many of the original buildings have been converted into flats. The British Army’s first purpose-built hospital, The Queen Victoria Hospital was built 1856-1863. Until 1902, the hospital housed the Army Medical School and treated thousands of wounded servicemen in the Second Boer War, First World War and Second World War. 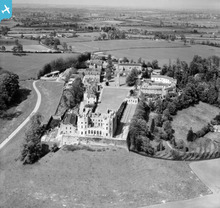 In 1963, a fire destroyed part of the main building and the hospital was demolished in 1966 with only the chapel being retained. 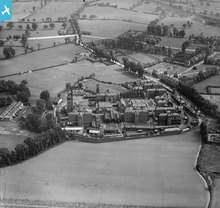 The Bedford County Hospital, now Bedford General Hospital. Built in 1803 to designs by John Wing. Rebuilt 1896-1899 to designs by Salter and Adams. 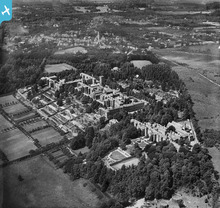 Planned by Birkenhead County Borough Council as a smallpox hospital, but opened in 1921 as a T.B. sanatorium. It specialised in orthopaedics, treating children suffering from non-pulmonary tuberculosis; and, in the early 1950s, long-stay child patients with psychosomatic conditions, or short stay child patients with mental and physical handicaps. Rebuilt in 1982 as a private hospital called Murrayfield. 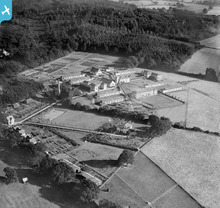 Tuberculosis sanatorium built around Bockhanger Hall, an earlier country house built in 1875 for James S. Burra. 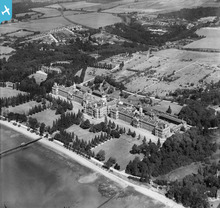 In 1913 the estate was purchased by Percy H. Jones who developed it as the Grosvenor tuberculosis sanatorium. The hospital closed in 1955, and was used as a private clinic from 1956 to 1958. In 1961 it was bought by the Metropolitan Police for use as a cadet training school, becoming a Home Office Police training centre in 1973. The centre closed in 2006 following a re-organisation of police training. 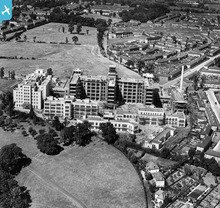 The Princess Elizabeth Hospital for Children was founded in 1934 to care for sick children from London. 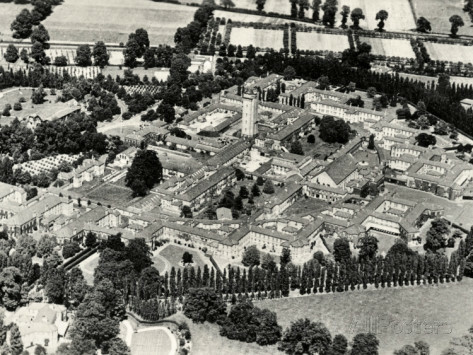 Construction suffered setbacks due to a fire and the outbreak of war and the hospital was not officially opened until 1948. 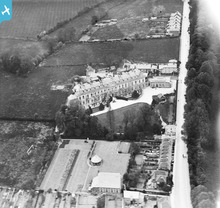 In 1973 the hospital became a satellite of the Manor Hospital in Epsom and was used as a hospital for mentally handicapped patients. It closed in 1998 and has now been converted to luxury apartments.